“I am the author of 17 books for kids and young adults, including two picture books: Snow Dance (Pelican, 2008), and Joshua The Giant Frog (Pelican, 2005). “My background is in anthropology, which has fueled many of my nonfiction projects such as Talking Bones (Facts On File, 1995). 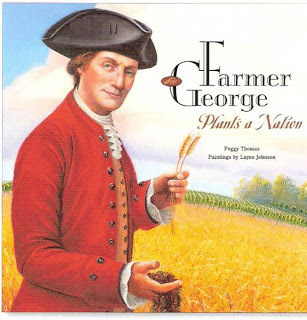 “Layne Johnson has illustrated more than a dozen picture books for children, including the acclaimed Farmer George Plants a Nation (by Peggy Thomas), a picture-book biography of George Washington’s life as a farmer, inventor, and scientist. Why did you choose to focus on work for young readers? PT: I suppose I focus on kids books because it has been the family business. My mother, Margery Facklam, has been writing kids books for more than 50 years. I learned early on that writing was a possible career choice, and what better genre than colorful, accessible, and creative children’s books. LJ: I’ve done loads of artwork, but being able to do art in narrative form for children was very enticing. It’s challenging to show, not just what the words say but what they don’t. I also remember how much time I spent combing over all the children’s books I had as a child–they made an impact on me. I soon discovered that, with children’s art, I could make a difference in the life of a child, too. How did you approach your apprenticeship, as a writer and an illustrator respectively? What helped you the most? PT: I was lucky enough to learn from one of the best. My mother was always my first reader, my most honest critic, and eventually my writing partner. 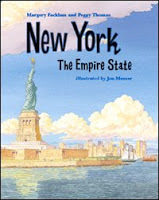 We even wrote two books together — The Kids’ World Almanac of Amazing Facts About Numbers, Math and Money (World Almanac, 1992) and New York: the Empire State (Charlesbridge, 2007), and we have been working on a third. LJ: Going from commercial art to the fine art of children’s picture books was such a career change. My old portfolio was useless. I had to think more emotively, and as I got books under my belt, developed more of my own style. Still, always looking at what all the other great artists are doing helped me to stretch everything I was doing. Attending SCBWI conferences and learning the business was a necessity! A good, encouraging, guiding hand from a respected editor or art director does wonders. PT: I lucked out with my first book contract. My mother was writing a book for a series on natural disasters. The writer who was working on the volcano book abandoned the project leaving the editor in the lurch. The editor asked my mother if she knew a writer who would be interested, and she recommended me. I have often asked my mother if she had a deal with the editor–that if I screwed up my mother would fix it, but she denies it. And I’m happy to say, she didn’t have to. I learned the publishing business on the fly, but I also had the best apprenticeship possible. LJ: Not long after I attended my first conference I started sending out postcards. I soon picked up an early reader book with Random House, and I was off. After completing a picture book assignment with a small regional Texas publisher, I then had more samples I could send out in postcard form. Albert Whitman and Co. offered me several picture book assignments, and my portfolio soon grew. When I changed from watercolor to oils in 2002, I found my stride and truly started developing a style I love. Congratulations on the success of Farmer George Plants a Nation (Calkins Creek, 2008)! In your own words, could you tell us a little about the book? What does it add to the conversation of books about George Washington? PT: Farmer George Plants a Nation is about George Washington’s earthier side. Before he was a general or president, he was a land owner who worried about keeping his plantation afloat. When he discovered that tobacco ruined the soil, he diversified and experimented with different crops and fertilizers. He worked to make Mount Vernon as self sufficient as possible. What he did on a small scale at MV, he applied to the new nation. There are hundreds of books about Washington and his military and political career, but very few about his farming interests. I think it humanizes an iconic figure and shows the importance of agriculture to the development of the United States. LJ: Well, basically Peggy hit upon a great, and to kids, fairly unknown part of Washington’s life–his love and respect of farming. I enjoyed showing George not as the mythical figure he’s become to some, but as a hard working, inquisitive, problem-solving sort of guy. That quality is what we all try to teach our kids, right? They can relate to someone like that. Telling that kind of story, in a non-didactic way was exactly what a good picture book can do! Peggy, what was your initial inspiration for writing the book? I got hooked on this project when I visited Mount Vernon with my family several years ago. There was a hot, stagnant line waiting to get into the mansion, but the shady path that led down to the farm beckoned. I started writing notes in the margin of my brochure and couldn’t get enough. And of course being a gardener myself I loved learning about his seed experiments, his inventions and his passion for trying new things. Layne, how did you connect with the manuscript? What about it appealed to you? I thought the story was fascinating from the first read. It had a perfect title, right from the beginning. It was funny, though–I thought, “There sure is a lot of poo in this story!” Ha! I realized that I would be able to show George when he was young and then age him–what a great challenge! How could I resist? I really connected to the story when I visited Mount Vernon. Standing on the piazza, looking out over the Potomac, I imagined George standing next to me. It gave me goosebumps. It still does. What was the timeline between spark and each publication, and what were the major events along the way? PT: I’m a slow writer. I think I went to Mount Vernon in 2001 and came home and began researching. I wrote an article for Cricket Magazine in 2003 (it appeared in 2005), and I sent a complete manuscript to Carolyn Yoder at Boyds Mills that same year. Carolyn is a wonderful editor and extremely thorough. After sending it out to experts, she reported back with great advice on how I could revise the manuscript. I had originally organized it by farming activities, but she suggested a chronological approach. It was difficult because Washington spent a lot of time away from home, and each season brought similar problems. But using a chronological approach and twice as many quotes, by 2005, I finally got the strong narrative that we had both been looking for. Up to that point, Carolyn wanted to use photographs and period illustrations for the book, but I felt strongly that kids needed to see George as a farmer. She finally agreed to illustrations, and Layne came into the project. I think I saw Layne’s first sketches in 2006 and was thrilled. And that was before I saw his color work that pops off the page. I could not have asked for anything better. LJ: As far as timeline, I’m thinking it took me from the time I first read the manuscript to turning in art (40 page book), about eight months. The major event to me was being patient and asking a lot of questions. I visited Mt. Vernon to do just that. The premise is if you ask and get the answers to detailed questions from both the author and the subject matter experts (Mount Vernon) before drawing anything, then you can render intelligent pencil sketches that need little revising. A non-fiction author and the experts are ultimately the ones who approve the pencils, after all. Everything worked. Not many revisions. Yay! What were the challenges (literary, research, artistic, psychological, and logistical) in bringing the book to life? PT: For me the most challenging thing was trying to create a narrative that flowed chronologically. It sounds like the simplest way to organize information, but it wasn’t. For example, in the original manuscript I talked about his experiments with fertilizers over time. Every year was different, but I couldn’t discuss every year. So now I had to clarify my focus and choose the most important aspects of those experiments. Sometimes it meant leaving cool information out. But the result was a stronger manuscript. LJ: The biggest art challenge I had to address was obvious to me as soon as I read the wonderful story. One a positive note, the story included many changes of scene. However, picture books do well with lots of action, and lots of emotion. But this story doesn’t have battle scenes or fighting or other big action elements. And in that time period, outward emotive behavior was not a personal quality to be cultivated by gentlemen. Pensive manner and personal restraint were qualities men of status wanted. See the challenge? I had to make sure George was portrayed accurately in this manner. I was determined to respectfully show George as the thinking man–the problem solver. What was your biggest research challenge? Your biggest coup? PT: A big coup was finding a quotation that was both meaningful, of the right time period, and understandable for fifth graders. Early American English is not always crystal clear. LJ: One of the hardest things to nail down was the plow-seeder. Just figuring out exactly what it would look like was challenging. Peggy and I spent some time on the phone talking about that. Once that was figured out, how would I clearly show its movement, what it did, how it worked? The biggest coup was being able to visit Mount Vernon. Seeing the reconstructed wheat treading barn was very helpful! Peggy, what did Layne’s illustrations bring to your text? Layne’s illustrations make Washington a real person. The reader doesn’t have to envision the staunch white-haired portrait of a dead president; they get to see a young man grow old. I was blown away when I saw the color proofs. They glow, and Layne’s panoramic perspectives make you feel as if you are standing on the grounds of Mount Vernon, turning your head to take it all in. I think Layne’s illustrations make this book the success that it is. The book includes a timeline, a further discussion of “George at Mount Vernon,” “George’s Thoughts on Slavery,” additional recommended resources, and a bibliography. How did this approach evolve? PT: In order to make the text the strong chronological narrative that I wanted, I had to take out important information that I also wanted to share with the reader, especially about the slaves at Mount Vernon. In the text, slaves are dealt with in a fairly unemotional way. They were part of Washington’s everyday life, and the text reflects that. But slavery is a very emotional issue, and Washington understood that too. However, his words and actions were contradictory. He owned slaves, but felt slavery was wrong. He did not try to abolish slavery but he did free his slaves upon his death. I think separating the narrative from the discussion reflects this dichotomy and allowed for a more thorough explanation. Because this is a book that kids may use for research, Carolyn Yoder and I felt that a quick-reference timeline and a bibliography would be helpful. LJ: I thought Peggy did really well here. I thought it appropriate to frame these pages with a tree George planted, one that’s still at Mount Vernon today, the tulip poplar (they’re huge!). Not only that–but to show the tree in all four seasons with the appropriate animals around. What advice do you have for beginning writers and illustrators? PT: Read all you can about the craft, and then take only what is useful to you. Every writer does it differently, and many beginners get caught up in the process rather than focusing on the act itself. It doesn’t matter if you use notebooks or index cards or digital files, as long as you are writing. It doesn’t matter if you write longhand or on a computer, as long as you are writing. It doesn’t even matter if you write every day or once a week, as long as you are writing. Find out what works for you. LJ: Join SCBWI and practice your craft. Don’t wait for editors and art directors to come knocking on your door. Get out there at conferences and meet them. In this economy, it’s hard. But don’t quit. Also, try your best to do the kind of art you really enjoy most. And don’t put your coffee cup too close to your paintbrush cleaning bucket! PT: When I am not writing or reading, I am probably monkeying around with my family or walking our dog Lily or snuggling with one of our five cats. I love to sing, so I am in two choirs, and I love to be outside in the garden. PT: My mother and I are working on a book about how to write nonfiction for children. We hope to have it out sometime next year. I just finished something different for me–a historical novel, which is just now getting out to editors, and I’m rooting around for my next children’s nonfiction project. LJ: I’ve been blessed to be busy. 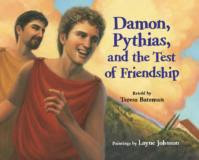 Damon, Pythias, and the Test of Friendship, written by Teresa Bateman (Albert Whitman, 2009) is just coming out now. I just finished the art for Off Like the Wind, The Story of the Pony Express, written by Michael P. Spradlin (Walker), which I believe has some the best art I’ve done to date. I’m currently in the middle of The Declaration of Independence from A to Z, written by Catherine L. Osornio (Pelican). After that, I have three more book projects with three different publishers slated–taking me well into next year. I’m very happy, but I’m gonna need a vacation!